Janice Arlene Lorge, aged 73 years of Moose Jaw, SK passed away on Thursday, December 13th, 2018. Janice was born in Moose Jaw, SK on March 1st, 1945 and grew up on the Berglind farm just south east of Moose Jaw. She spent her life in Moose Jaw with her true love, Lou, who passed June 11th, 2018. They had just celebrated their 55th wedding anniversary on June 5th, 2018. She was predeceased by her parents, Lloyd and Florence Berglind; and in-laws, Ed and Alma Lorge. Janice leaves behind her two sons: Curt (Jackie) and their daughters Gabrielle and Rachel, and Brent (Darcy) and Brent’s son Madison (Kristina), their daughter Elliot, with a little one due in March, Brent’s son Zachary (Elly)-just engaged, Brent’s son Jeffrey; Janice’s brother, Keith (Joey) Berglind, Janice’s sister, Bev (Bill) Itcush; sister, Wenda McArthur; sister, Debra Berglind; brothers-in-law, Jack (Rolande) Lorge, and Dave (Moe) Lorge; as well as many nieces and nephews. Janice worked for the Moose Jaw Public Library, Red Cross and VON, and has been a tireless volunteer and supporter of the Friends of the Library. She loved baking and craft work and was an excellent sewer and stitcher. Her greatest strength lay in her unwavering support of Lou and the boys. She inspired them to their creative pursuits, Lou and Brent with their passion for cars, and Curt with his books and sports. In keeping with Janice’s wishes, no Funeral Service will be held. There will be a private family ceremony in the spring to spread her ashes on the farm in Shaunavon, SK where she can again be with her beloved Lou. 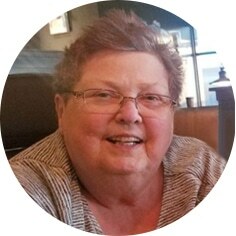 In lieu of flowers, donations in Janice’s name may be made to the Friends of the Library c/o Moose Jaw Public Library, 461 Langdon Cres, Moose Jaw, SK S6H 0X6. Arrangements are entrusted to Moose Jaw Funeral Home, 268 Mulberry Lane. Todd Sjoberg, Funeral Director 306-693-4550. Janice will be at peace with Lou now. Thoughts and prayers with all of you. Remember the good times and They will be will you.